Brand new multigame arcade machines, with all the great retro classics. Hand-built in the UK with high-spec components. All come with free delivery, backed by award winning service. We are passionate about retro gaming, and reliving the classic arcade games of the past. The GamePro arcade machines are some of our best selling arcade machines as they are hand made in the UK, to a very high specification and are exclusive to Home Leisure Direct. 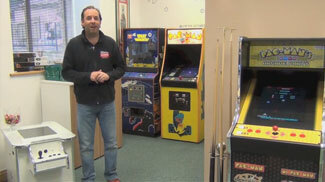 They have a great variety of some the best loved classic arcade games and look great too. They come with two controls, so these games are great fun when playing solo or with a friend. These machines are great fun for all ages, whether playing them for nostalgic reasons, or discovering them for the first time, they are still as enjoyable and as addictive as ever. They come with a fantastic variety of the best remembered original arcade games such as Centipede, Donkey Kong, Donkey Kong Jr., Frogger, Galaga, Pacman, Ms. Pacman, and Space Invaders to name a few! For a full list of games, take a look at the products listings of each model. If there is a particular set-up, specification or set of games you are looking for then just let us know. There are plenty of retro arcade machines on the market, featuring all the classic arcade games. But many of them are either cheap low quality imports or have been made to keep the price as low as possible and have compromised on the quality of parts and components used. The main designs are the Cocktail design, which is reminiscent of the old school classics which were found replacing pub tables during the early 80s, and the Upright, made to look the way arcade machines used to - with a full size design but with less depth to better fit into modern homes. When we specified the GamePro range we decided to focus on the specifications and games first, and then see where the price needed to be. Taking this approach we said to ourselves "what specifications would we want to buy? What parts would we want fitted to ensure the best graphics, sound and playability?" You'll find the result is stunning. Using the best quality components and construction, each of these GamePro machines is sturdily built and plays superbly. We have many of these arcade machines on display in our showroom, so you can come along and see the quality of build and gameplay for yourself. These products usually take from 3-4 weeks to be delivered, though it may be quicker in some circumstances. For further advice on our retro arcade range please contact a member of the team free on 0800 622 6464 for friendly, helpful and knowledgeable advice.